The Theatre at the Sanctuary of the Great Gods in Samothrace (photo: Ministry of Culture and Sports /Ephorate of Antiquities of Evros). 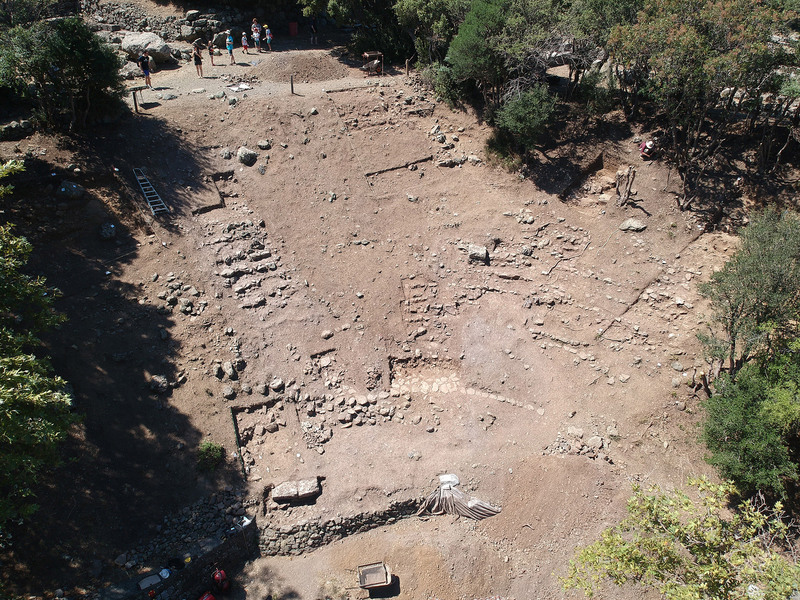 Works were completed at the sanctuary of the Great Gods in Samothrace on August 8, 2018, conducted by Emory University, Atlanta and the Institute of Fine Arts, New York University under the auspices of the American School of Classical Studies at Athens. Research was headed by professor B.D. Wescoat of Emory University, Atlanta. 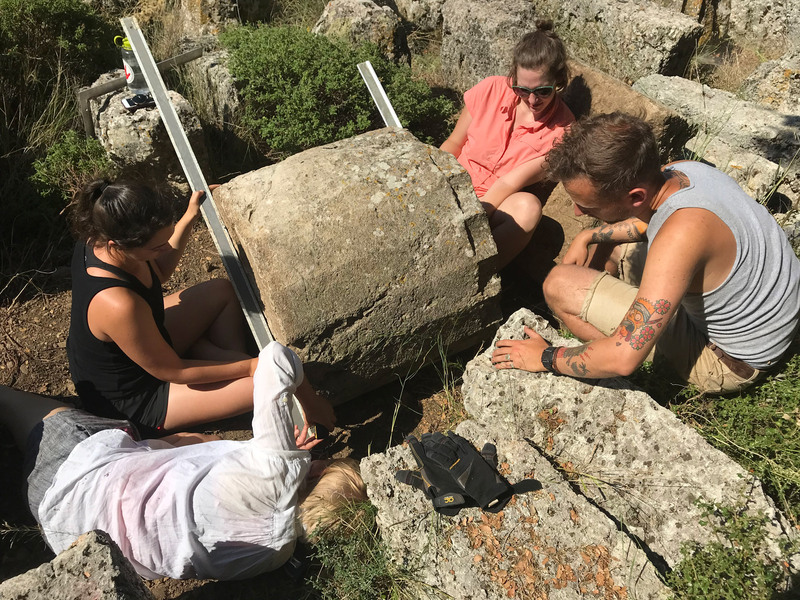 The American expedition conducted excavations this summer for the first time after 22 years, as part of a new five year research programme whose implementation was approved by the Ministry of Culture and Sports and supervised by the Ephorate of Antiquities of Evros. Research on the Sanctuary of the Great Gods on Samothrace which had known great fame from the end of the 4th up to the 2nd century BC, offers an excellent though fleeting picture of the important role of this mystical cult in Hellenistic times. This year’s investigations focused on the monuments of the south part of the Sanctuary of the Great Gods, located round the monument of the famous Winged Nike/ Victory of Samothrace, the Stoa, the Enclosure of the Nike and the Theatre. Excavating the Theatre made it possible to rediscover some architectural elements that had come to light during the Franco Czech excavations of 1923, such as traces that define a) the orchestra’s perimeter, b) eight rows of seats, c) four flights of steps and d) the location of the diazoma. Parts of seats were also located of vibrant red rhyolite and white limestone and the remains of a large clay conduit with a diameter of about 0.25 m which ran under the floor of the diazoma. The scientific team worked simultaneously to publish the architecture of the Stoa and the monuments that framed its terrace. The Stoa is distinguished both for its scale and its construction materials: it is almost 104m long and is the only big monument of the Sanctuary built exclusively of local limestone, coming from the Akrotiri quarry near today’s Kamariotissa. Although not one stone survives in its original place above the Stoa’s base, it has numerous architectural elements: To date, over 1,700 limestone architectural members have been found , 1,000 clay fragments from the roof and numerous fragments of plaster from the decoration of the inside walls. Careful calculations showed that the entire base has a steady gradient of 1:100 from south to north. This gradient was intentional and to arrange it, modifications were done to the colonnade and the northern entablature. The terrace surrounding the Stoa was an excellent place to exhibit large scale votive offerings which were impressively placed around the Stοa, framing it. The Monument of the Nike was without doubt the most imposing of them all. The architectural remains as a whole, fragmentary as they are, show that apart from the Doric column of the monument of Philip V, there were other monuments on the terrace such as: one with Ionian columns, several monuments with pillars ,perhaps one with square pillars and lots of smaller monuments constructed out of different types of marble. Finally, work continued for the further development of a three dimensional digital model of the Sanctuary, while the metrology of the architecture of Samothrace was studied as were the petrographic analysis of local stones used in the sanctuary’s architecture and the finds originating from the Stoa’s excavation in the 1960s.